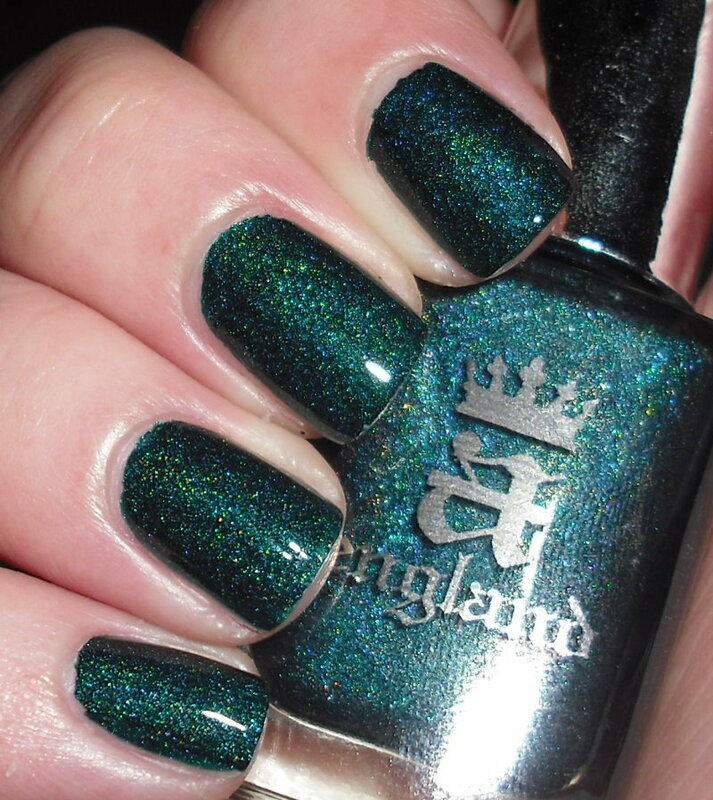 When I first saw swatches of a-england's new "The Legend" collection, I knew I had to have some of these. My experience with a-england brand has gone above and beyond my expectations since the beginning. The founder Adina, has to be one of the kindest and most sincere people out there. She truly loves her customers and fans. This is all on top of spectacularly made polishes. This is a recipe for an overall wonderful nail polish experience. Saint George, one of the newest polishes is absolutely divine. Saint George is a deep teal with a blue and green scattered holographic effect. The pigmentation of this color is rich and saturated. One thing I notice with holographic polishes is they have a tendency to be sheer at first. This is most definitely not the case with Saint George. If you wanted you could get away with one thick coat. The color is stunning. The holographic effect is beautiful. 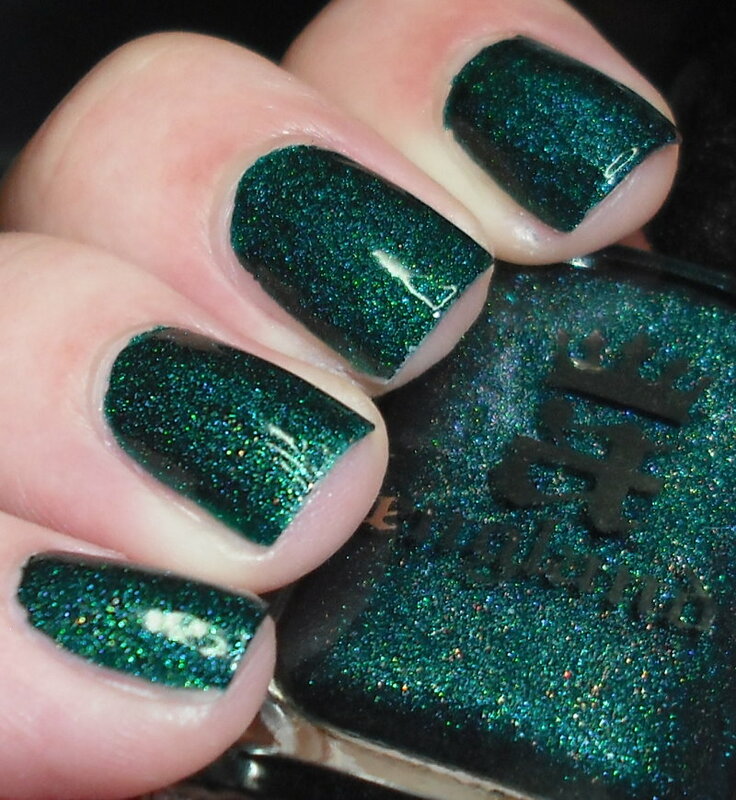 This color has a permanent spot in my Top 20 of 2012 list, and it is only the beginning of February. I honestly do not think any other polish this year could top this. This is absolutely a must have. 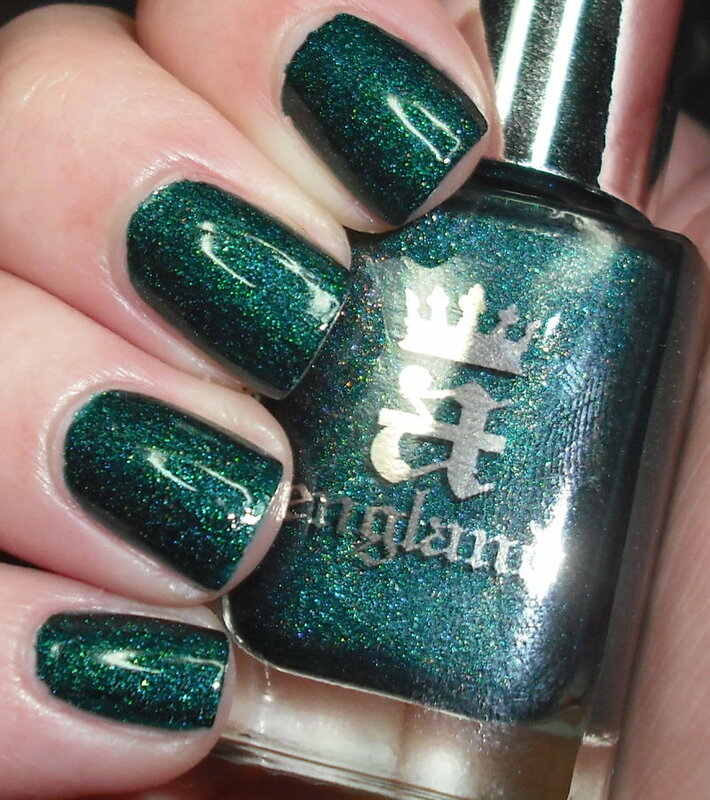 You can purchase Saint George and other The Legend polishes on a-england's website, Overall Beauty, or llarowe. Every time I see this polish I want it more and more. Looks a-mazing! I cannot wait to get this polish. I ordered it this weekend and I already know that this would be my 'desert island' polish. Gorgeous! I love this! I ordered the entire collection 2 days ago and can't wait to get my hands on them. And I must agree, Adina is just the sweetest person, not to mention her outstanding talent in creating mesmerizing lacquers. I love your swatches of this one! AAAAAAAAAmazing. I ordered Dragon, but I'm still waiting on it to come in:[ I need it on my nails nowwwwww! OMG! I must have this NOW!